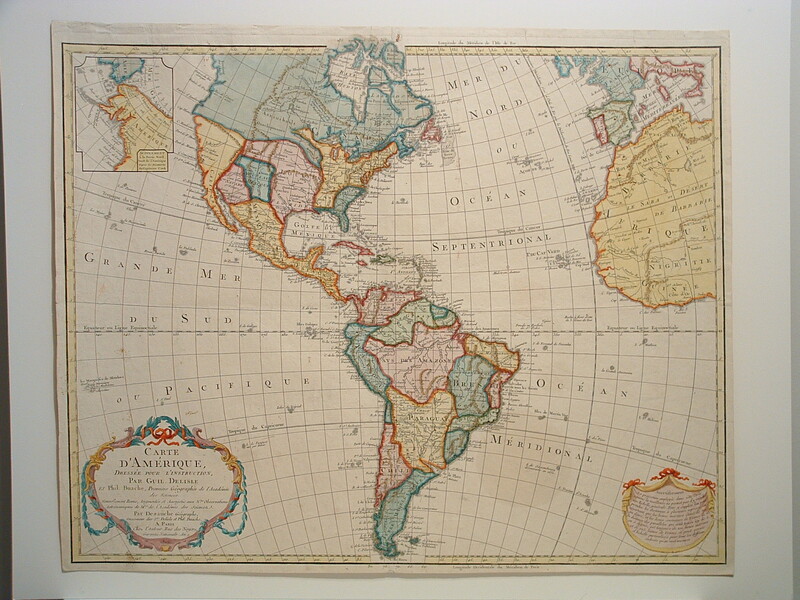 This edition of the Delisle map of the Americas, first published in 1722, was extensively updated through numerous revisions. It includes the information from Cook’s discoveries in the Northwest and Alaska in an inset “Supplement a la Partie Nord Ouest de l’Amerique d’apres les Decouvertes du Capitaine Cook.” The newly independent United States extends to the Mississippi River in the west and to Florida in the south. In this edition the Privilege is changed from “du Roi” to “l’Auteur Rue des Noyers Garantie Nationale An. 9.” After the French Revolution the Royal arms were erased from the cartouche and replaced by ribbons, the king’s name was removed from the title, and the date (An 9) is the French Republican calendar for 1800.